We’ve started collecting as many barbacoa videos as possible at YouTube in a playlist. We’re only collecting videos of hornos de la tierra, ie, earth oven cookery, not home oven or steamer “barbacoa”. There is nowhere on the internet or in books or magazines with more original source material on barbacoa than YouTube. You can find regional variations from all over Mexico, from barbacoa de borrego found in Central Mexico in backyard dirt hornos or commercial brick pits. There are various versions from the North, even Texan versions that only use the head of a cow. There are version from the Mixteca in Oaxaca using shallow rectangular pits that include not only meat, but giant tamales. There is, of course, the Yucatan’s cochinita pibil. And there are the various versions from the West, such as birria de chivo. To see the amazing diversity of Mexico’s barbacoa, really the best place is YouTube. We will keep adding videos as we find them, so keep checking back. If you find a good one that’s not on our list, let us know. 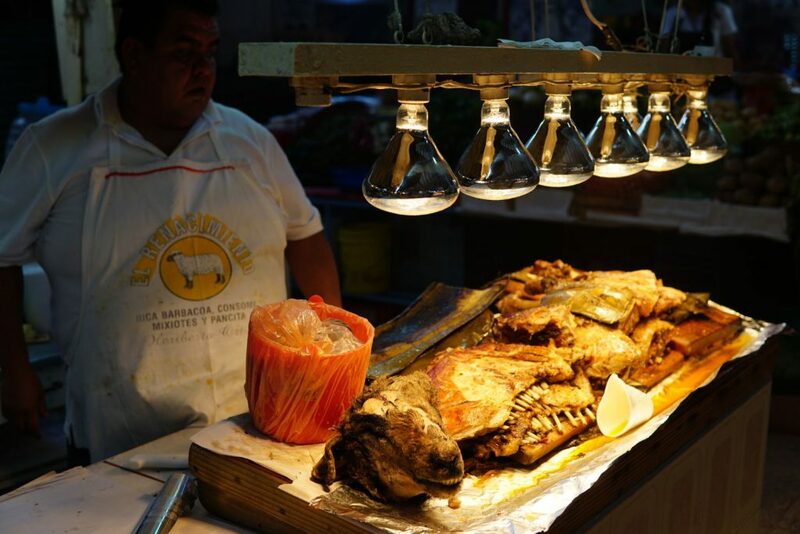 There are many wonderful places to eat barbacoa around Mexico, but a few places stand out as extraordinary, places that transcend the quality, as good as it may be, of the barbacoa. For El Pica, it’s the overwhelming spectacle of a town within a town, this barbacoa wonderland that serves far more people each day it’s open than the entire population of La Purificacion, the pueblo it inhabits. Entering El Pica through the tunnel of trees brings back memories of hopping on the boat for the Jungle Cruise at Disneyland. 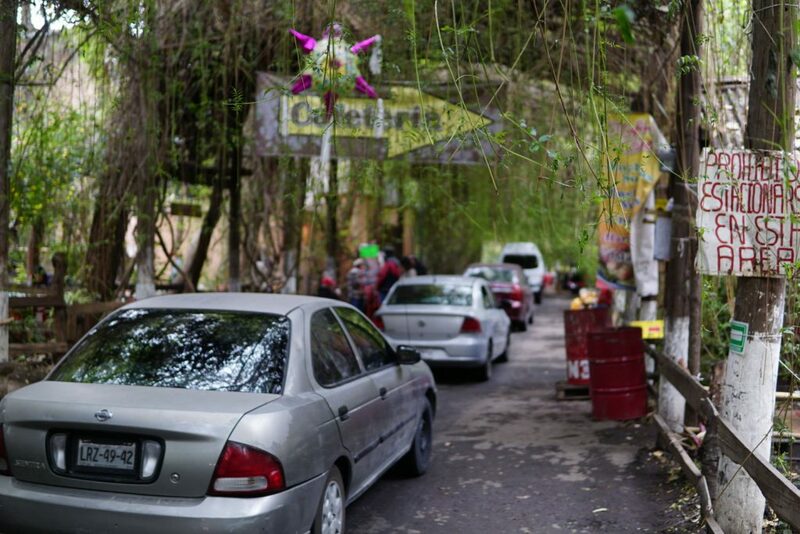 The whole complex is a maze of pathways through vines, vendors around every corner selling tlacoyos, menudo, pan dulce, salsas, avocados, tamales, chicharron, and, of course, barbacoa. The Torres family started in 1967 with just one horno, but now serve as many as 48 lambs a day from 12 hornos. They cook mixiotes of rabbit and chicken, pancita, and consome in the hornos along with the barbacoa. 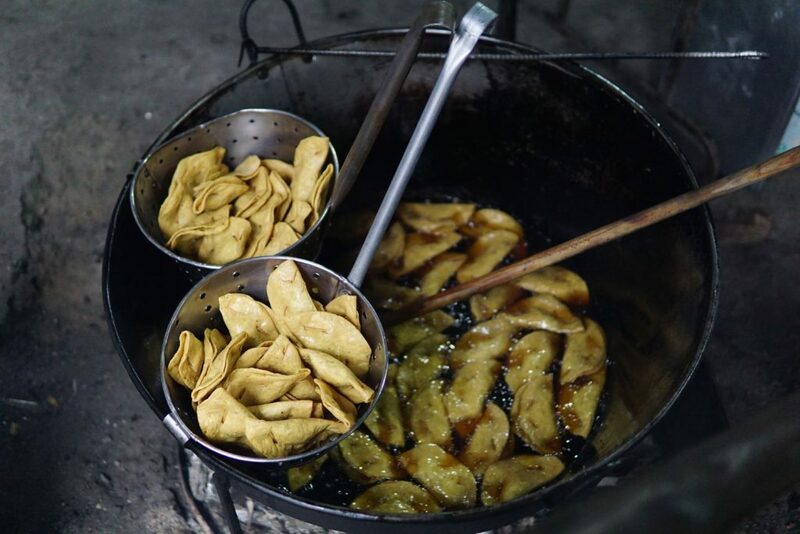 Tortillas from nixtamal, fresh pulque, pork skins fried until bubbly and crisp before your eyes — the emphasis here is on quality. Families picnic in verdant dining rooms wallpapered with the leaves of the trees surrounding them. Mariachis move from family to family offering their serenades. Abuelitas walk the pathways carrying buckets of consome to consume then or later. Paco and I wandered El Pica just trying to absorb it all. Even after spending several hours there, we would discover something new and delightful. There was so much to see, we barely took time to eat. We tried a few things, but the sesos quesadilla, fried in the fat of the freshly-made chicharron and stuffed with barbacoa and salsa verde, offered to us by Saul, the son of the original barbacoyero, was spectacular. Another place I can’t wait to return to. El Pica, in La Purificacion, Texcoco, is a massive complex of Mexican food delights. You enter through a tunnel of trees and vines, like a ride at Disneyland. 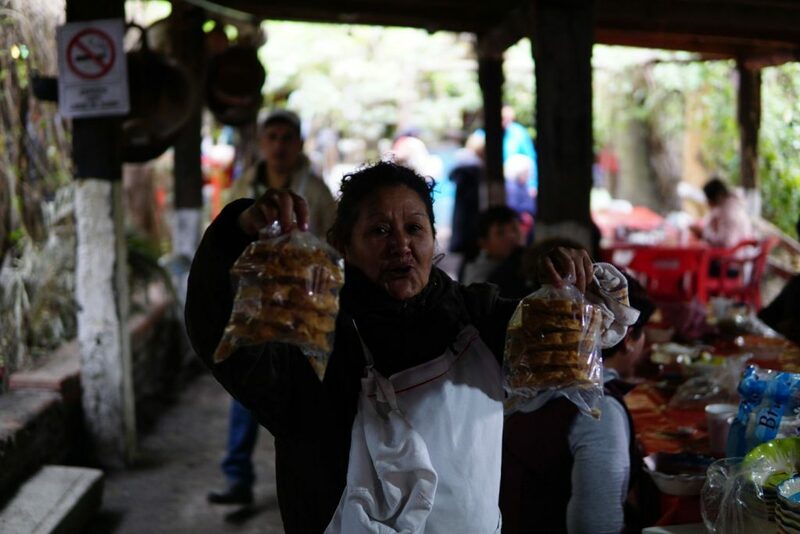 While the Torres family has been making barbacoa here since 1967, around 20 families from the town also sell various foods, such as tlacoyos, desayunos, pan, salsas, chicharron, tamales, and so on, to the thousands of people who come here each weekend. El Pica in La Purificacion, Texcoco, has 12 hornos. Here they are removing the mixiotes, barbacoa, pancita, and consome and serving it up. For barbacoa de borrego aficionados, the reputation of the pit-cooked lamb in the state of Mexico is second only to that of Hidalgo. The state has dominated Mexican culture since at least the time of the Aztecs, who took an island in the middle of a lake no other tribe wanted and turned it into an empire. Texcoco was part of that prehispanic empire, one of the three city-states that founded the Triple Alliance. Today it’s more of a blue collar suburb of Mexico City, just 20 miles east of the megopolis, just past the marshy vestiges of the lake that bore its name and the massive new airport being built. The greater municipality remains rather rural. Driving through the curvy mountain roads dotted with small pueblos it’s hard to imagine what people might survive doing that they weren’t doing 100 or 200 years ago. As is often the case, the places that maintain their traditions the strongest are rarely those places that are the most successful on the national and international stage. Financial success requires changing with the times (some might say “selling out”). Maintaining centuries-old traditions is about survival (often of a community and families). 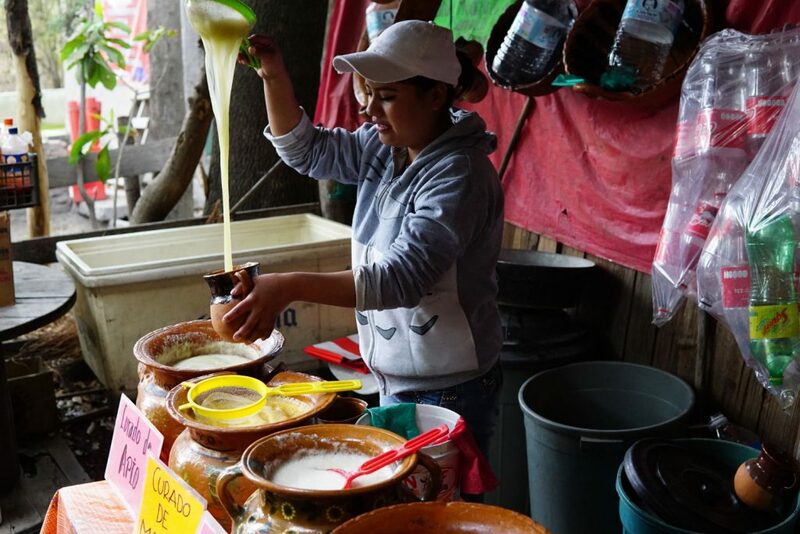 Texcoco lacks Mexico City’s financial success, but its barbacoa tradition is strong. While there are some very good spots for barbacoa in Mexico City, most are imports, families that brought their traditions with them and now serve Chilangos. I know of no market in Mexico City with a “zona de barbacoa”. 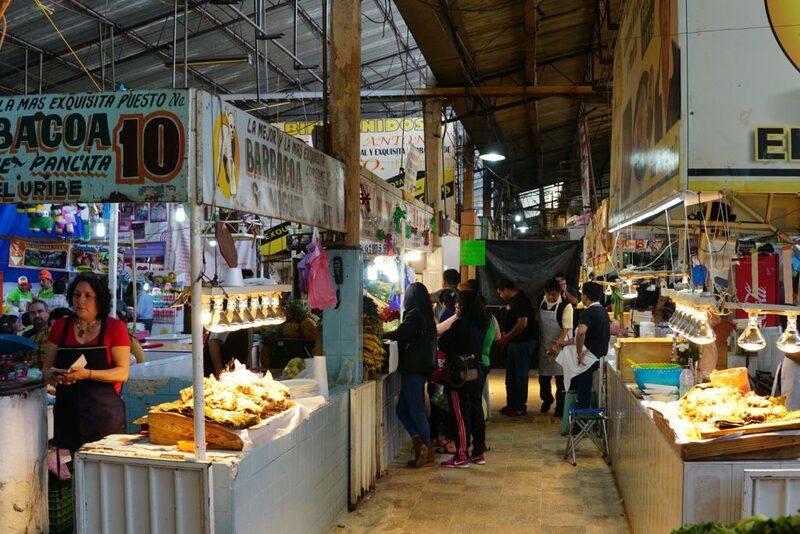 But when you walk into Texcoco’s central market, the Mercado de San Antonio, just off the central plaza, you are greeted with a sign directing you to just that, a zona de barbacoa. I haven’t found a market with a larger concentration of barbacoa vendors yet, not even in the towns of Hidalgo. There are 20 or more stands, all claiming to make barbacoa in a traditional horno. Quality varies, of course, but there are some gems. Our favorite of the ones we tried was El Pichon. It had two things going for it: 1) the barbacoyero had the girth of a man who knows food, and 2) when we walked up, he was dipping spring onions in liquid lamb fat to grill them. He actually had a comal dedicated to sopes, quesadillas, and tlacoyos where everything was griddled in lamb fat. That’s my kind of guy. And his barbacoa was quite good. The espadilla was unctuous, lightly seasoned with salt, and redolent with maguey flavor. 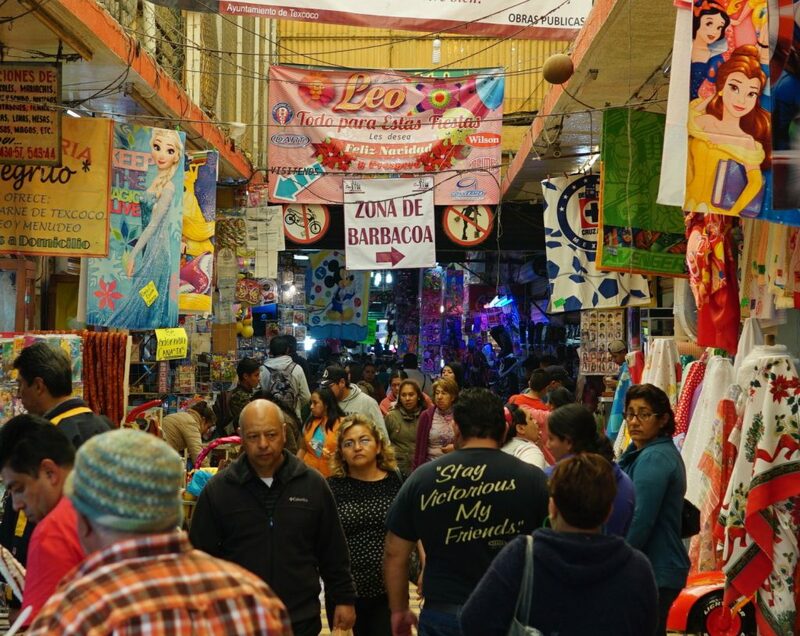 I haven’t had a chance to explore the offerings in the city of Texcoco entirely. We talked with a few barbacoyeros around town and planned to return Sunday, but the unique greatness of El Pica overwhelmed us and by the time we went back through the city, it was too late. There are spots that open only on weekends with multiple hornos doing things right that I would love to try. I will get back. One of the most difficult parts so far of researching traditional barbacoa has been trying to nail down its history, both recent and pre-Conquest. There are plenty of myths out there — the things people say and repeat, often without any evidence other than that someone else said it. But I’ve been surprised at how thin the historical record is and even more surprised how thin the anthropological/archaeological record is. Even in books devoted to the history of food in mesoamerica, earth oven cookery is rarely mentioned. Remains of earth ovens with rock heating elements of various sizes and configurations are common at hunter-gatherer sites around the world. They span the last 30,000 years in the Old World and some 10,000 years in the New World. Although various foods were baked in these ovens, plants predominate. 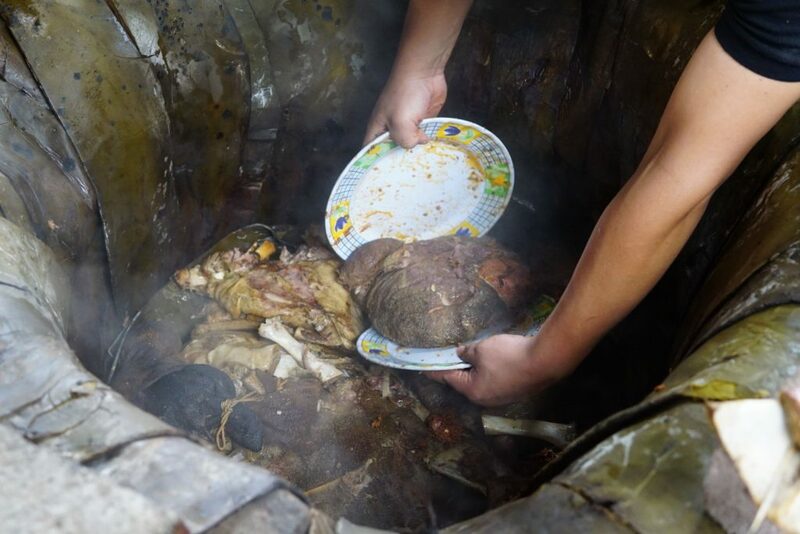 Earth ovens are ethnographically well documented as family-size and bulk cooking facilities, but related technology and its archaeological signatures remain poorly understood and understudied. These ubiquitous features are often mischaracterized as generic cooking facilities termed hearths. It is proposed that, in fact, most rock “hearths” are heating elements of earth ovens. Reliable identification and interpretation of earth ovens requires documentation of heating elements, pit structure, rock linings, and various remnants thereof. Fundamental technological concepts for investigating their archaeological signatures include thermodynamics, construction designs, and life cycles in systemic context, as informed by ethnographic, archaeological, and experimental data. Earth oven technology explains well the primary purpose of labor-intensive thermal storage for long-term cooking and conserving fuel. Information from the extensive archaeological record of earth ovens on the Edwards Plateau of south-central North America illustrates these points. 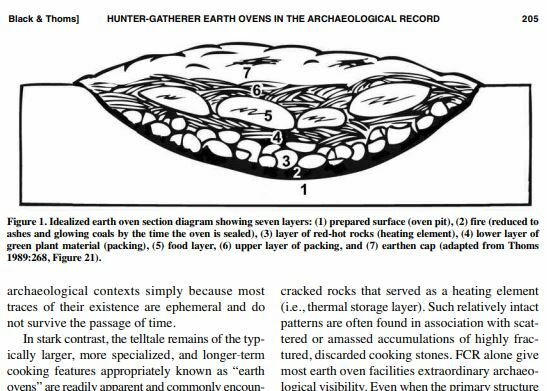 It’s really a primer on the archaeology of earth ovens. The bibliography will be an opportune rabbit hole that I look forward to getting lost in, but the article itself has a lot to offer, including the basic timeline of earth oven usage and its spread across the globe, how to spot the remains of earth ovens, the science behind the effectiveness of earth ovens, the nutritional advantage of earth ovens, and the basic technology of how earth ovens work. In its moist-heat baking mode, a typical earth oven consists of seven layers (Figure 1), from bottom to top: (1) prepared surface (i.e., basin or deeper pit); (2) fire (reduced to glowing coals and ashes when oven is sealed); (3) layer of hot rocks; (4) lower layer of green plant material, which we call packing; (5) food being baked; (6) upper packing layer; and (7) earthen cap. The packing layers envelop the food, keeping it clean, supplying critical moisture, and adding flavor. Moist heat allows the food to undergo hydrolysis, during which complex molecules are broken into smaller, more easily digestible molecules (Wandsnider 1997). A moist-heat baking environment is also essential because, as long as adequate moisture from the packing material and food is retained in the oven (water is sometimes added), the temperature of the food remains below the phase change from water/liquid to steam/gas (ca. 100°C) and thus prevents burning/charring the food (Stark 1997). This gives basic insights into the process for making barbacoa and what is necessary to the process and how it has changed or stayed the same throughout its history. I can’t help but notice, for example, that while we think of this earth oven technology as primarily a means to cook meat, the earth ovens were originally used more for vegetables, especially those least digestible. I have always thought of mezcal production as a post-Conquest technology. However, the cooking of the agave roots in large underground pits, while it may today be used almost exclusively as the first step towards turning starch to sugar to alcohol, it is clearly a process that pre-dated the Spanish, but turned the starch to sugar to food. If you want to check out some of the field work Black and his students are doing on earth ovens, you can check out this blog post on earth ovens in Nevada, too.